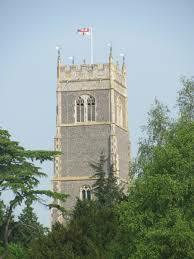 All Saints Church, Ramsholt,stands alone at the top of a low hill overlooking the River Deben. It may have been a watch point to give warning of invasions from the sea and it’s impossible to sail past in either direction without looking up at it and feeling recognition. My father’s ashes are in the churchyard and my mother plans to be buried there as well. Even Francis, non-Suffolk-born and a non-believer, has said he would choose Ramsholt to be his resting place. The church yard is unkempt and full of wild flowers, either blooming, delicate and colourful, or withering and dying, gently, in due season. The round tower has buttresses that make it appear oval. I wonder whether they were added because even the original builders realised that the mix of flint rubble and septaria they were gumming together was not the most durable material? Ramsholt church's Norman tower was already being repaired in 1300 when they bought coralline crag from the Aldeburgh area to strengthen it and to shore up the nave roof. This church is not awe-inspiring and eternal; it’s a vulnerable structure, surviving only because it has been cared for. It's human-scale. Ramsholt church has been part of my family’s life ever since I can remember. As children we were regularly dragged away from the crabbing, mud-larking, sandcastle-making pleasures of the foreshore and walked up the deep lane where there had been farm-workers cottages. I think I can remember their ruins but there is no trace of them now and perhaps my memory comes only from description. No, that isn’t so … I do remember – tangled masses of brambles mainly and the sadness as my father explained how the East Suffolk countryside had been depopulated. Or climb his knees the envied kiss to share." The church itself had come close to dereliction in the mid c19th, the thatched roof had collapsed, the nave was open to the sky; the walls were green with damp. But that was before my time. By the mid c 20th, when I was a child, the church had been saved, re-furbished, re-roofed. I think it was very much as it is today, though without the deliberate wild-flower cultivation. We children used to explore the graves, shiver at the carved skulls, look for families buried together or for the tiny plots of infants. 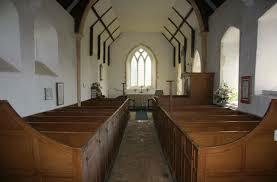 I didn't then see the interior of the church as beautiful although the box pews may have piqued our interest. I remember it as plain and possibly ... dull? My father loved it but I couldn't see why. 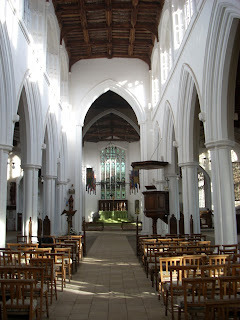 We were used to the splendour of fifteenth-century perpendicular St Mary’s Church, Woodbridge. I was christened in St Mary’s – it was hats, best suits and polished shoes; banners, incense and processions -- and a nice line in urbanity. When some doting relative exclaimed at the sweetness of my baby fingers the then Rector commented that they’d look very much better when I was older and they were curled around a gin-and-tonic. When my mother moved back to Woodbridge, many years into widowhood, she tried re-joining the St Mary's congregation but it wasn't long before the sensory overload of colour and carvings, music, manners and quasi-Mass became too much for her tired mind to process and, after the third successive occasion when she’d fainted during the service and been wheeled out with the greatest kindness, I decided we should look for somewhere smaller scale. Religion is important to Mum -- the more so as her dementia has progressed. Nor cast one longing, lingering look behind?" The elders from St Mary’s ran fortnightly services in her extra-care accommodation and this was a lifeline. They were (and are) a tiny, friendly, genuinely devout group – but communion in a sitting room, even with hymns, was not the same as worship in a “proper” church. 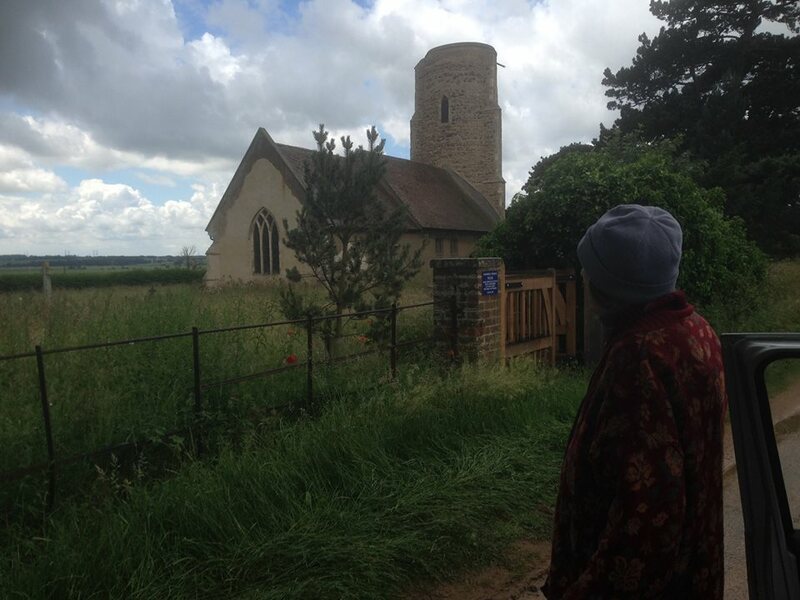 In 2014 Ramsholt Church tower was yet again At Risk . A local artist donated a large water colour to be auctioned for the restoration fund and my nephew, George, escorting Mum to lunch at their favourite pub, the Ramsholt Arms, dug deep into his father’s cheque book to buy it for her. We were invited to a "Heritage Day" and I discovered the church ran regular bi-monthly services, even though there was no one attending from the immediate parish any more. 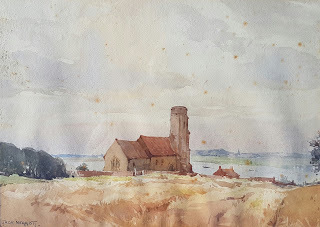 Ramsholt Church uses the Book of Common Prayer and the words she mostly knew; their hymns were traditional and sung wholeheartedly; the regular congregation was small and welcoming without making any social demands that she couldn’t meet. We felt safe as we fastened ourselves into our box pew and listened delightedly to the wheezing of the pug dog accompanying its mistress a few pews ahead. “Didn’t those children behave beautifully all the way through,” she commented on our last visit. “The ones in the pew in front of us. 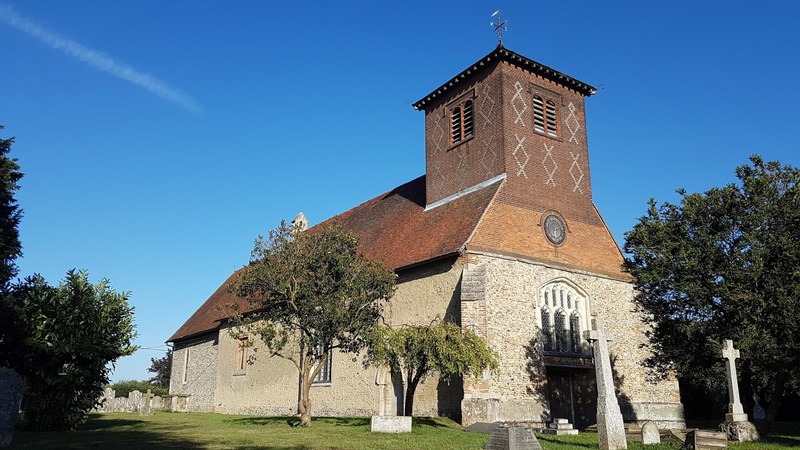 You’d hardly have known they were there.” In my perception the pew had been empty; the entire congregation solidly in the over-sixties cohort but Mum's experience is more imaginative. The quiet church air was full of ghosts for her. Not particular people (though we always had to visit Dad after the service for tears at the grave) but others, forever unknown, who have uttered those same words, followed identical rituals, felt hope, penitence or inspiration in this long-established place. Some kindred spirit shall inquire thy fate." Being in church with Mum has helped me realise how separate spirituality is from theology; reading and sermons are unintelligible to her, the meanings of central Christian festivals such as Christmas and Easter are almost entirely gone yet her experience is effortlessly spiritual. It's not identical with aesthetics, nor with the joy and wonder of a cloud-heaped sky or glittering river. This is unequivocally religious. What she discovered in those Ramsholt services (and sometimes, fleetingly, in the little St Mary’s group) was a sensation she could call God. There was a service at Ramsholt the day before she left Suffolk (as far as I know) for ever. I whispered our farewells to others in the congregation but I didn’t tell Mum. I couldn’t bear to. She’d said to the vicar so often “the next time I’ll be here you’ll be taking my funeral”. Now it seems likely to be true. Nor up the lawn nor at the wood was he." We're not giving up of course. Her new parish church of St John and St Giles, Great Easton, looks rather like a mother hen and its congregation rallied to take her under their wing. An outing to nearby Thaxted Church left her breathless, literally. She was transfixed. Her lips went blue, her limbs froze. We weren't even at a service but the space, the light, the atmosphere -- wherever she looked there was the invisible rustle of past believers. “Imagine what it was like for those people when they were singing their first hymn here,” she said suddenly. I stopped wondering whether I should call the paramedics and thought how glorious it was that she could feel this way and how glad I was that there are still places able to evoke such a visionary response. Thank you, Julia for this sublime elegy, evoking so many memories and feelings, though I've never been to Ramsholt Church, you took me there, poetically, like William Carlos Williams' "Solitary Disciple" observing "the jasmine lightness of the moon" above the steeple. All that and more, Julia. Thank you as always. When some doting relative exclaimed at the sweetness of my baby fingers the then Rector commented that they’d look very much better when I was older and they were curled around a gin-and-tonic. Thank you for this beautiful, elegaic post Julia. It brought tears, but the good sort. Absolutely beautiful Julia. And brought back such memories. My mother had a similar faith I couldn't share - rooted in joy and beauty. It always filled me with regret that my logical approach made me an alien! I don't know much about Faith but my dad who lives in medium level dementia care goes to church four times a week (!) - it does him a world of good and the beneficial effects seem to last for hours each time: easier train of thought and forming of sentences and a generally more lively demeanour. An occasion of Grace or is it just the repetition of a lifelong habit? So don't spare the church visits! Special thanks are due to all the parishioners on his transport roster. Wonderful as ever Julia, it's heartening to know your mother still has deep insight and is able to find anchorage in the familiar church atmosphere. The ritual of religion is outside time (in the sense of a forward moving narrative) and is often comforting to those with neurological conditions. I recall Oliver Sacks telling the story of a middle aged man with no memory after he was young, unable to form any new memories, through brain damage, but he could find focus and familiarity in church services - music can have a similar effect. Your mother is fortunate indeed to be cared for by people who care for her inner life as well as her outer one. I'm without words, Julia. Just beautiful. Thank you so much for giving us this post. That gave me a little shiver. It reminded me of when my partner clearly heard music and singing in an old church while I heard nothing but the sheep and birds outside. Who's to say it was your mother's imagination? My partner was certain that he imagined nothing. He came up with all sorts of rational reasons why the musicians and singers he heard were nowhere to be found. 'They slipped out the other door as we came in,' was one. Beautiful, moving post, Julia. Thank you. Beautiful, loving, and truthful. What more can we ask? Thank you all for such kind comments but actually, when I think about it, those unknown church builders did all the hard work, Thomas Gray provided the insight and Mum the inspiration. But the beautiful prose was yours, Julia! It's even more frustrating than usual arriving late at your post, because the others have used up most of the words that came to me. It's lovely, Julia. Thank you.